Pro-life supporters march in Rome on Mother's Day (March 12); meanwhile a hundred of left-wing activist also rallied to remember Giorgiana Masi, the 18-year old who was killed in 1977 during a rally celebrating the anniversary of the victory of the divorce referendum. Straight into the arms of Francis I, the new Pope: the pro-life march held in Rome on May 12 (Mother’s Day) couldn’t have asked for a better ending. 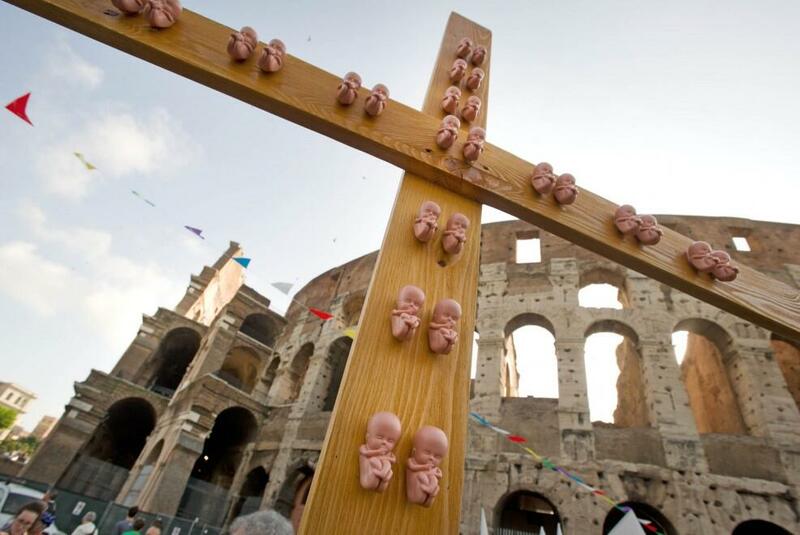 For the third year running, shouting slogans like “Abortion is murder”, thousands of people marched through the streets to the Vatican where, during Sunday Mass in St Peter’s Square, Bergoglio devoted many concerned words to the war against abortion. “Abortion is not a religious problem,” the Pope told the crowded square, “but it’s a scientific problem, because conception is the moment when the genetic code of a new individual is created.” That’s why, he continued, the embryo must have legal protection, because it’s already an individual. And the not-so-hidden meaning is that this protection is from women and against Italian Law 194, which declares abortion to be legal and free in public healthcare. Thanks to the widespread action of Catholic associations, Law 194 is no longer respected in most Italian hospitals and family counselling organizations, so exposing women to great suffering and risks. In recent years, Catholic organizations such as “Comunione e Liberazione” have taken control of many public hospitals and family counselling organizations, practically wiping out the free application of Law 194. It has become more and more difficult to find doctors or nurses who do not object to the Law. Over the past 20 years, the number of abortions in Italy has more than halved but the Catholic offensive is stronger than ever. Around 20,000 backstreet abortions are estimated to take place every year, a number that is bound to increase if legal and free abortion in the public healthcare system is no longer available. Among the demonstrators there were as many as four ex-ministers from the centre-right party PDL: Maurizio Sacconi, Giorgia Meloni, Maurizio Gasparri and Carlo Giovanardi. At the head of the march was the Mayor of Rome, Gianni Alemanno, the same person who denied permission for a rally of feminist groups and social movements against the march to be held. The counter-demonstration was held anyway and was dedicated to the memory of Giorgiana Masi, an 18 year-old student shot and killed by the police on May 12 1977, during a rally celebrating the anniversary of the victory of the divorce referendum. Her murder, as the President of the Commissione Stragi (the commission on murders carried out during the “strategy of tension” period in the 1970s and 1980s, and during the most violent terrorist period of the mafia) said, was part of the strategy of tension and was used to support the authoritarian solution against that period’s social turmoil. The person guilty of her murder was never found, even though Francesco Cossiga, Minister of the Interior in 1977, admitted in 2007 that he knew who shot her. Walking through Rome today, one could see many links with that period, links that are always there but which sometimes are particularly highlighted. As a hundred people remembered Giorgiana, Gianni Alemanno marched with the pro-life demonstrators and with fascist organizations like Forza Nuova. Alemanno’s father-in-law and political mentor of his youth, Pino Rauti, was considered one of the inspirations of the neo-fascist terrorism that underpinned the strategy of tension with bombs, murders and beatings, working with (and even inside) some of the state institutions. In the meanwhile, the electoral campaign for the election of the new Mayor of Rome is ongoing. The PD candidate, Ignazio Marino, cannily decided to keep his distance from May 12’s events.